I’m not sure that the London Borough of Hounslow’s tourist industry needs encouragement, though despite having one of the world’s busiest airports (and if our current government gets its way having managed to pass a vote on its expansion, one that will certainly be, despite all promises, busier, noisier and more polluting if an extra runway actually gets build) on its doorstep it doesn’t seem to be a major tourist attraction. Most are only too keen to get away from the LB Hounslow as fast as they can, by tube, taxi or expensive train. But there certainly are parts worth a visit. 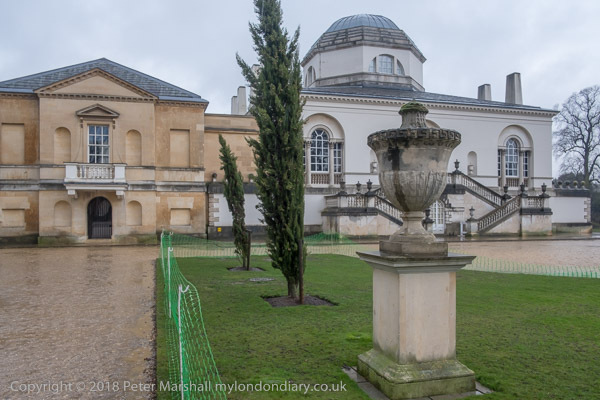 Some houses – Chiswick House, Syon and Osterley and areas of housing; a splendid piece of riverside, a few interesting small museums including Hogarth’s House. And quite a few parks with points of interest, the finest of which is perhaps the grounds of Chiswick House. And these gardens are free to visit, open all the year round. I grew up a few miles away and visited the gardens here a few time when young, brought by my father, a keen gardener, who always carried a pair of scissors in his pocket to take the occasional cutting when no-one was looking, and when near home, some seeds of the decorative giant thistle echinops to scatter in any likely looking bare patch of ground because they were so good for the bees he kept. Then I think the gardens were overgrown, and the giant conservatory dilapidated, but both have now been much restores. 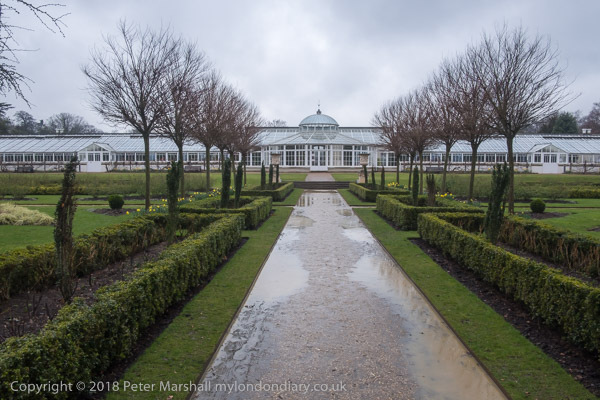 The huge greenhouse – which people always said was built by Joseph Paxton of Chatworth and Crystal Palace fame (he was a gardener and not a footballer) but wasn’t – was really built by mistake. It was built in 1812-13 to the designs of Samuel Ware and was then the longest ever, at 2 feet over a 100 yards. The 6th Duke of Devonshire was then owner of the house and ordered it to put his camellia collection in. These plants, which grow wild in much of south-east Asia, became a great craze at the end of the 18th and early 19th centuries, selling for high prices and making fortunes for some nurseries. Some have survived from back then and are now very rare. I suspect my father took a few cuttings as usual, and there may still today be some from here surviving in some of the gardens in Hounslow he looked after, though the better of these are now long covered with flats. It was probably the high prices that made people want to molly-coddle them, or perhaps just ignorance. They grow in their native soils in greater extremes of weather than we see in England, and just a few days earlier I had seen one in a front garden not far from our home with its flowers covered by snow. Though conservatories like this one would have been pleasant places to sit and walk and view your collection of plants, so perhaps the roof and heating were more for the benefit of people rather than plants. 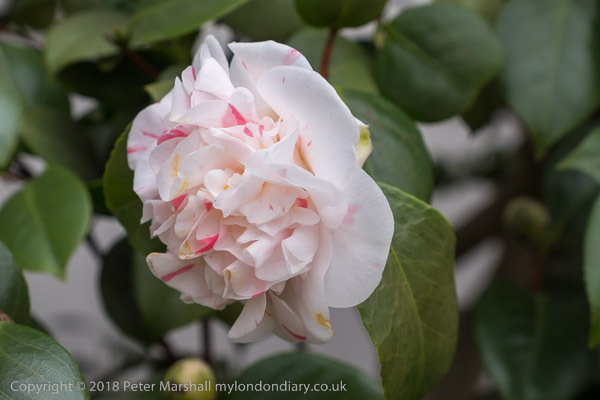 And if you are not a gardener and wouldn’t know a camellia from a chrysanthemum, you will almost certainly have some familiarity with the drink made from the dried leaves of one variety of camellia. We call it ‘tea’. The rest of the gardens were really the start of a new movement in garden design, the first “natural” garden in what became known as the ‘English Landscape Movement’, designed by William Kent for Lord Burlington, who also had the house built to his own designed, aided by Kent and copying the work from various Italian buildings, particularly those of Palladio. The house was built in 1726-9 but work went on with gardens for some years. Although the gardens may be natural they contain many unnatural features of classical origin, the house and gardens representing Burlington’s attempt to create a Roman villa situated in a symbolic Roman garden. Photographers will of course recognise them as they featured in several fine pictures by Bill Brandt, and of course many other photographers including Edwin Smith. I’ve made a few pictures there in the past, but make no claims for these hurried snaps taken on a dull and wet day on an outing with others who were keen to get back to the car. Both house and gardens are worth a visit, and the gardens and conservatory have been well restored (doubtless thanks to idiots buying lottery tickets.) There is a charge of entry to the house which is run by English Heritage, but the gardens are free. There is also a newly opened restaurant in which we had lunch, but I’d recommend a riverside walk from here to one of the Hammersmith pubs for a proper meal. You could also visit (on a Thursday or Saturday aftenoon) the small William Morris Society museum on Hammersmith Mall, and if sufficiently organised to book in advance, take the fascinating guided tour of Emery Walker’s house in Hammersmith Terrace. Remember Fukushima. The disaster began seven years ago, but it is still happening, and will go on for many years . Radioactive materials are still escaping from the melted down cores of the three reactors damaged by the March 2011 earthquake and tsunami damaged reactors, with the water needed to keep the No 1 plant core cool still releasing around 2 billion becquerels a day – although the bequerel is a very small unit, still a substantial amount. 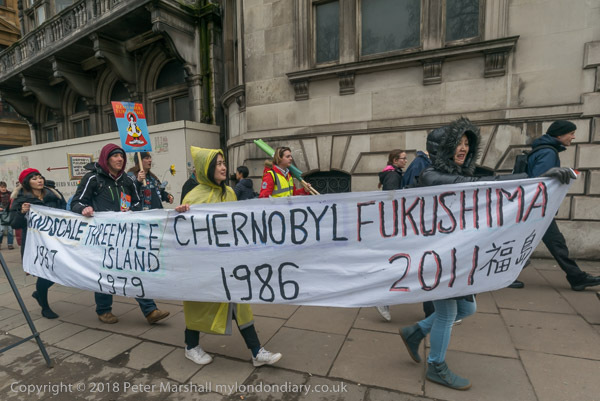 Recent research by the University of Manchester has also shown the surrounding area up to several kilometres from the plant to be contaminated with micro-particles containing radioactive uranium. Different isotopes have widely differing decay rates, but the clean up will certainly take hundreds if not thousands of years. 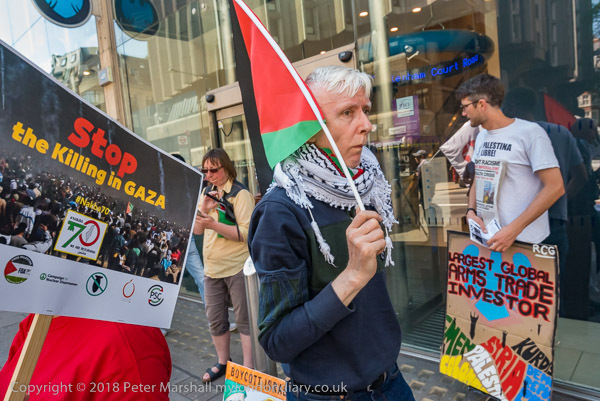 The photograph at the top of this post uses the fine poster for the event which has a precis of the what of the occasion and why those taking part are doing so. 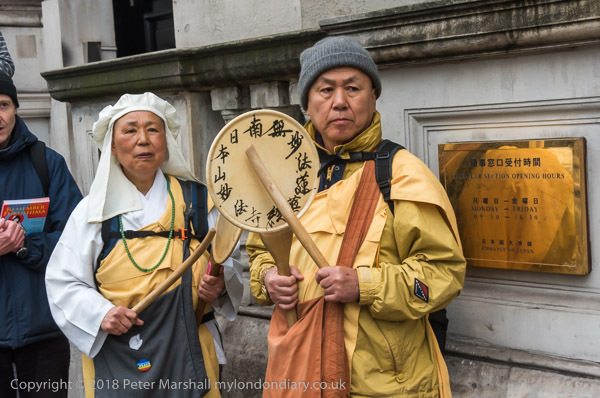 In the second image I’ve included the brass plate of the Japanese embassy along with the two Japanese Buddhist monks taking part in the event. 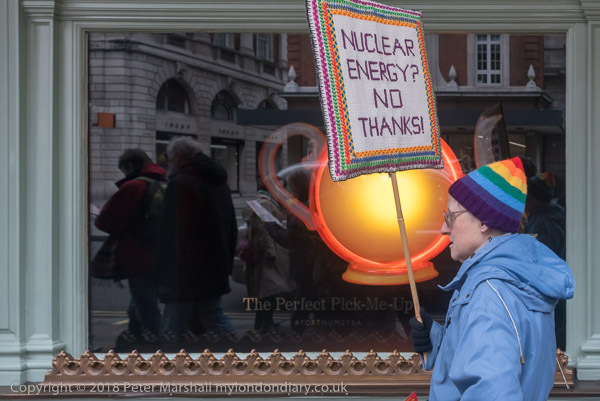 Passing Fortnum & Mason on Piccadilly I was intrigued by the window displays featuring various teapots, one of which I thought perhaps looking a little like the overheated core of a reactor, and I photographed it with one protester who comes to protests with her own hand-embroidered placards which often attract photographers walking past. 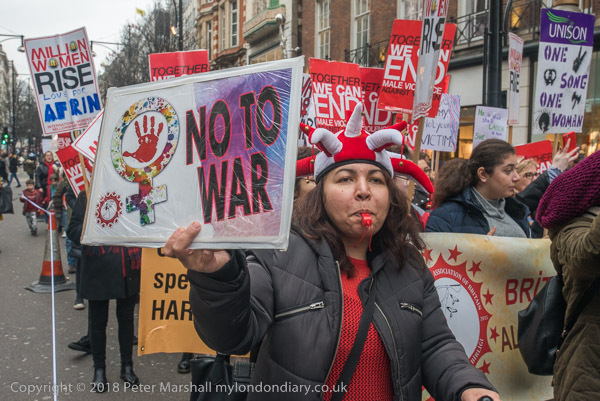 She is a woman who used many years ago to work with my wife and I often go and have a few words with her when I see her at protests, but I kept to my normal practice of not posing people when I’m photographing events. I’m there to record events not create them and simply stood in the right place to take the picture as she walked past. But of course you have to create pictures, by making use of what the event has to offer. 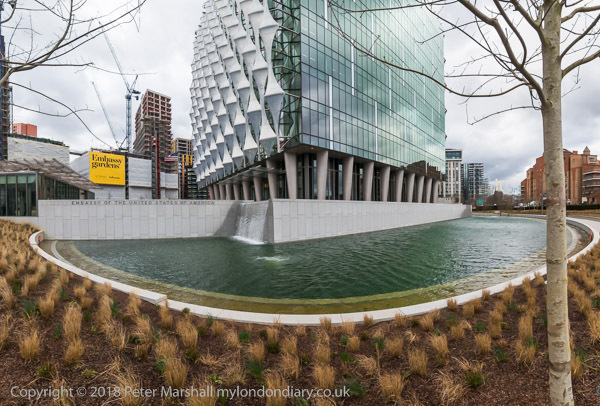 I’ve photographed Bruce Kent on many occasions (not always as he would have liked, but never unkindly) and on My London Diary you can see some closer views as he spoke. But in the tightly-cropped head and shoulders view he could be speaking anywhere about anything. 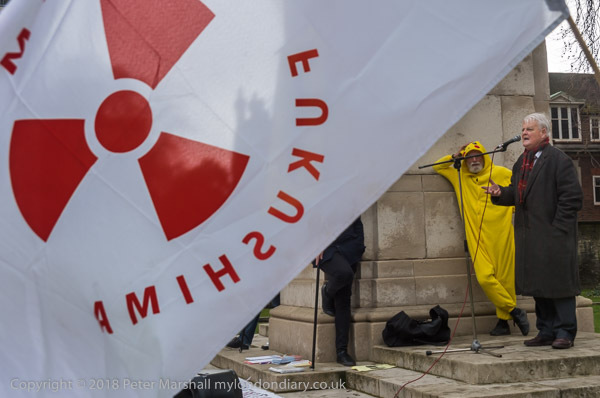 While in the picture above only those familiar with Westminster will recognise the plinth on which he is standing in Old Palace Yard, the radioactivity symbol makes fairly clear the nature of the event, and assuming you can read back to front that it is about Fukushima. The figure in the yellow suit beside him perhaps helps, and certainly draws the eye to the speaker (though perhaps the yellow arm and leg on the point of a toe do give an impression of boredom). Of course I didn’t set this up – or I might have found some way to get the flag the right way around. There was quite a breeze, and the flag was fluttering fairly wildly and while it might have been easier to get someone to hold it still in the correct position with a hand out of frame I didn’t do so. Nor did I ask the person holding at right out of frame to keep the bamboo pole still and at the same angle, though it would have made life easier. Partly I didn’t do either of these things as it would go against my idea and training of not manipulating the news, but also because I remain convinced of the value of chance and accident which often make my images rather more exciting than any limited ideas I might have about making pictures. 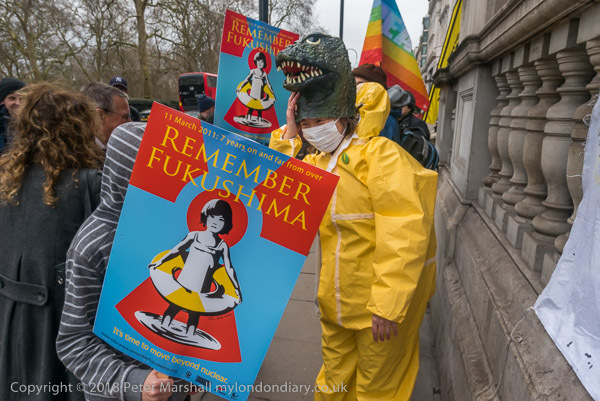 Rather a lot more to see on My London Diary at Remember Fukushima, 7th Anniversary. I’m not a great traveller, as I’ve often noted here. 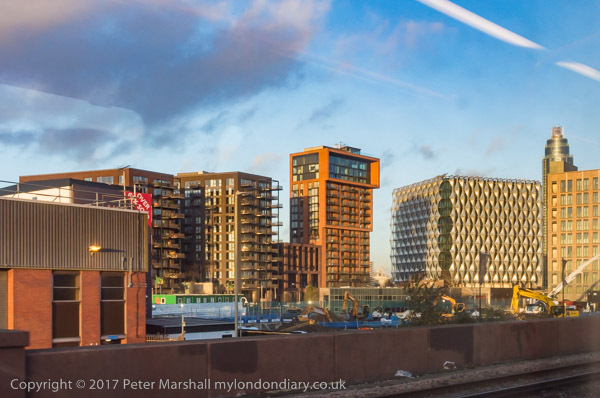 Though I have occasionally been lured away by the delights of Paris and Hull as well as a few trips further afield, London still has so much to offer. 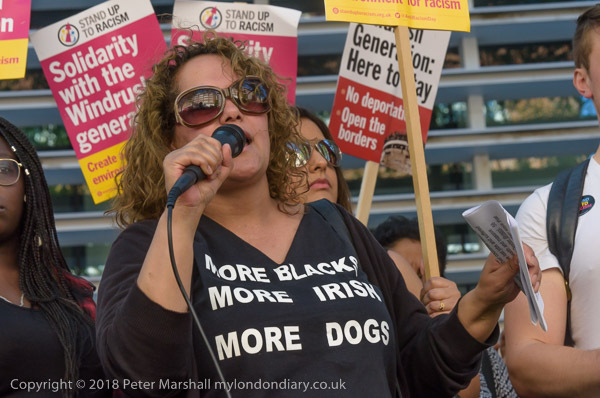 And people come here from all around the world, not just as tourists (though sometimes it does seem most of the world’s population is cluttering our streets) but to live and also to protest about events back in their natal countries. After the Million Women Rise march (with a strong migrant contribution) I found a large block of people standing in neat rows in Parliament Square in one of a number of protests called around the world by the South Korean based NGO The Association of Victims of Coercive Conversion Programmes (AVCCP) called after the death of a Korean girl, Jo In Gu, allegedly suffocated by her parents for refusing to take part in a religious conversion programme. 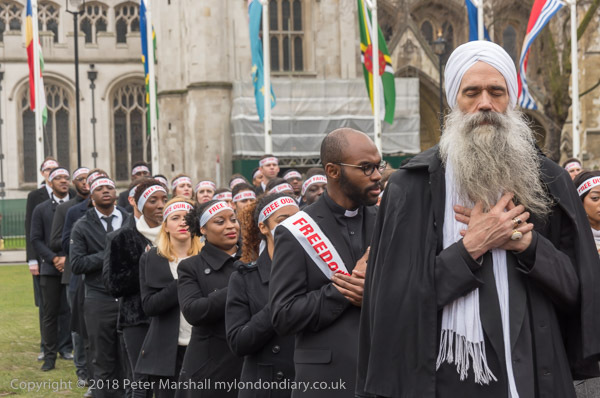 Those taking part were certainly not all Koreans, but came from various countries and faiths, including Sikhs, Buddhists and Christians and varied musical traditions, including a Scotsman with kilt and pipes. 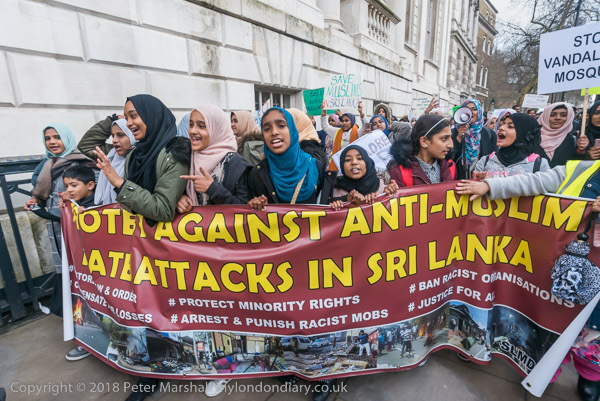 I hadn’t actually come to photograph the AVCCP protest but the Sri Lankan Tamils who were protesting opposite Downing St against the continuing attacks by Buddhist mobs in Muslim neighbourhoods around Kandy which have destroyed shops, restaurants and a mosque. They say the Sri Lankan government, which has declared a state of emergency and closed down much of social media, does not take effective action against attacks on minorities and accuse police and soldiers for failing to try to stop the attacks. They see what is happening as part of a deliberate policy of ethnic cleansing by the government. 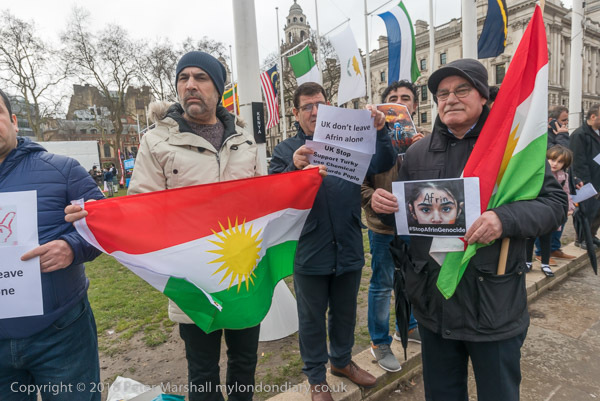 Back in Parliament Square another protest was taking place, with Kurds arriving to protest against the Turkish attacks on Afrin. 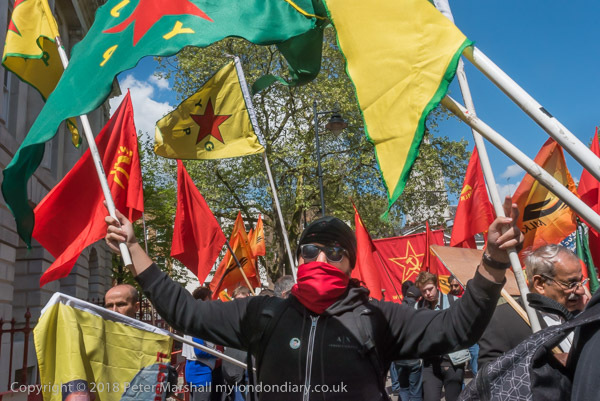 They want the British government to take action and end its support of Turkey who has been the major supporter of ISIS and who is using former ISIS and al-Qaeda forces in its attack on Afrin, where the local authority reports that 220 civilians have been killed and 600 injured. Unfortunately the British government supports Turkey, turning a blind eye to all its (and President Erdogan’s) faults because it sees it as an important NATO ally in opposing an increasingly threatening Russia. Meanwhile of course Turkey is increasingly making overtures to Russia which has established itself as a major player in the area through its support of the Syrian regime. The Tamils left Downing St to march to the Sri Lankan Embassy, but another protest was now taking place, part of the annual Tibet Freedom March in London commemorating the Tibetan National Uprising of 1959, 59 years since a huge mass of 300,000 Tibetans prevented the Chinese Army from abducting the Dalai Lama, Tenzin Gyatso. 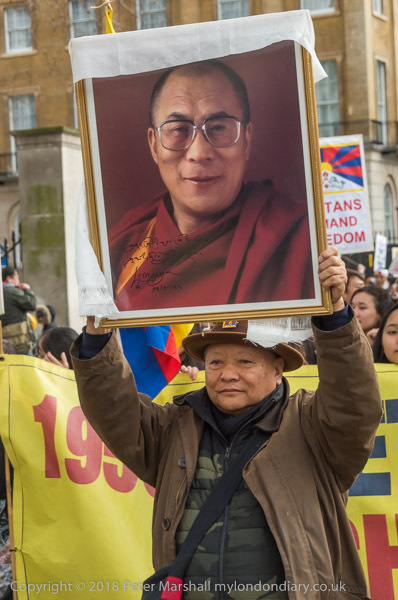 A few days later, after his palace came under artillery fire, he escaped with his ministers making the 14 day journey across the Himalayas to India while the outnumbered and poorly equipped Tibetan Army fought off the Chinese. 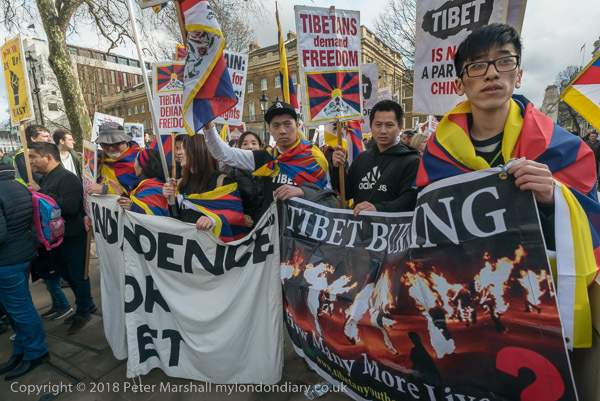 At Downing St there were some short speeches and a rather Tibetan long prayer as well as the singing of the National Anthem before those attending, mainly Tibetans or of Tibetan origin but with quite a few Western supporters set off to march to a protest at the Chinese Embassy, but I left them to go in the other direction and make my way home. 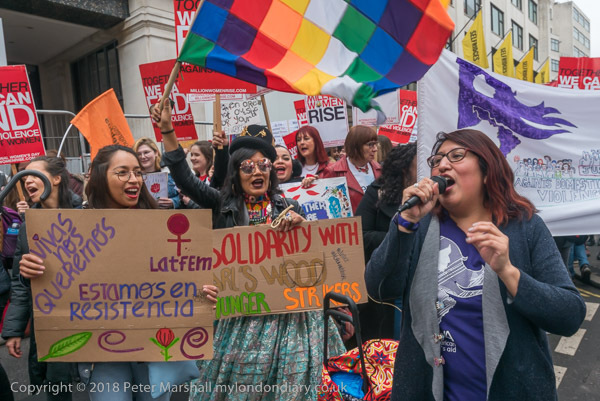 Like so much more in London, the annual ‘Million Women Rise‘ march against violence against women is greatly enhanced by presence of many from our migrant communities, such as the Latino feminists in the picture above. 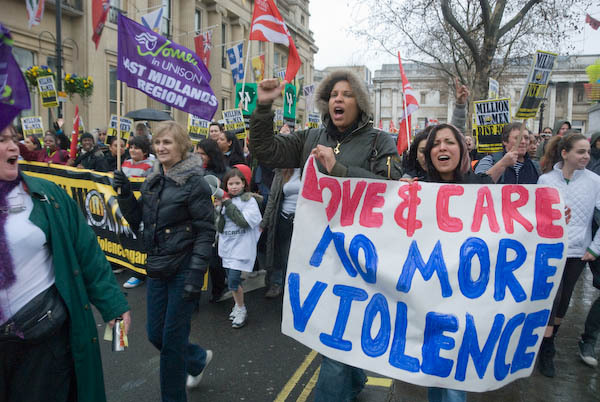 It takes place in central London on the closed Saturday to International Women’s Day. 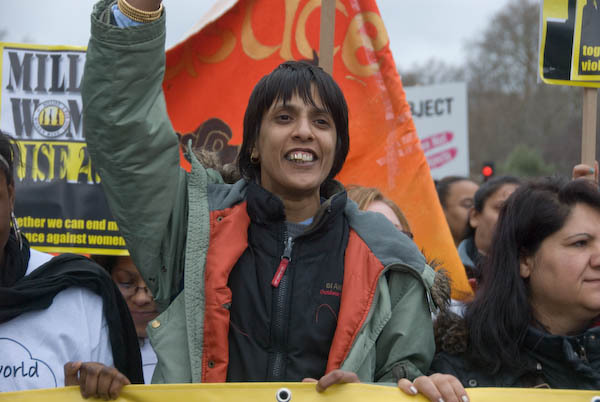 I first came across the event and photographed it and its founder Sabrina Qureshi (below) in March 2008, which was I think the first mass march, though the numbers then were about 2-3,000 and seem to have remained roughly constant since then – and most years I think I have taken at least a few pictures. Looking back at the two here from 2008 I can also see how much raw processing software has improved over the last 10 years; Lightroom was then in version 1.4, and many of us were still smarting at the loss of the then superior Rawshooter when Adobe bought up Pixmantec. I’m still unsure how much the acquisition was for the technology or simply to remove a better competitor, but it took a few more versions for Lightroom to really catch up – and perhaps only now does it really enable us to do a better job, though, as in the top picture here it is rather easy to overdo the colour saturation. Although I had no problems on that occasion (and later allowed the organisation to use some of my pictures), being a women-only march has sometimes caused some difficulties in covering the event, with a few over-zealous stewards some years who have objected to men being anywhere near the event. 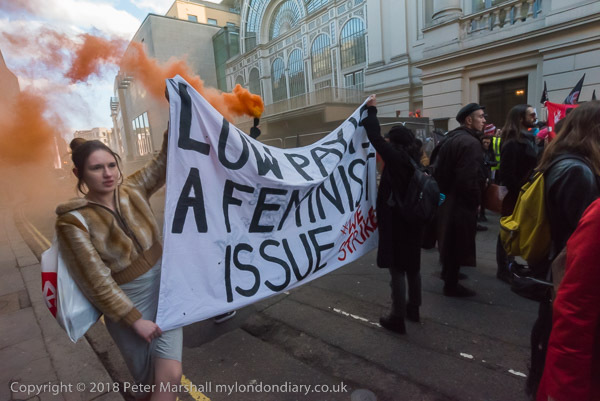 Although some years there have been some of the women’s groups who have insisted that their male comrades march with them – leading to some fierce arguments – I’m happy to stay on the sidelines during the march (and have never tried to attend the rally) despite this often making my normal photographic close approach impossible. So you will see in the pictures from these events rather fewer extreme wide-angle views and rather more work with the telephoto. 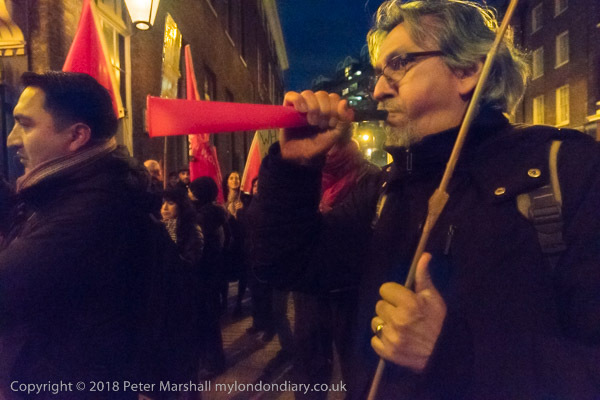 This year things seemed a little less rigid than some earlier occasions (and I did see a few men actually marching) and there were just a few occasions when I put at least one foot on the roadway to take pictures during the march without getting attacked. But generally, since I know that it is important for some of those on the march that it is a women-only space, I keep well out of it. Things are a little less defined before the march starts, when marchers in any case spill over onto the pavement. 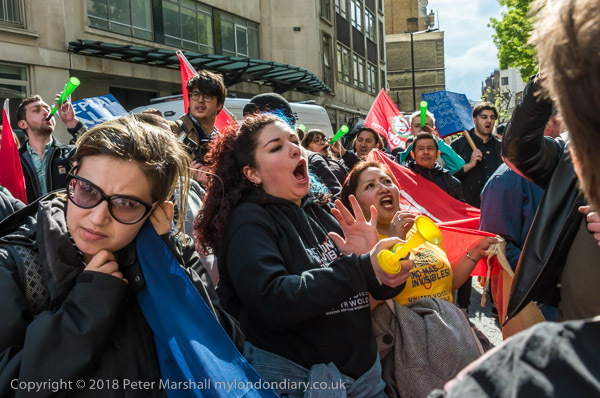 Of course it isn’t just Britain’s migrant communities on the march, but looking at my pictures it is surprising to me what a great proportion they make up, though my pictures may well not reflect the march as a whole. 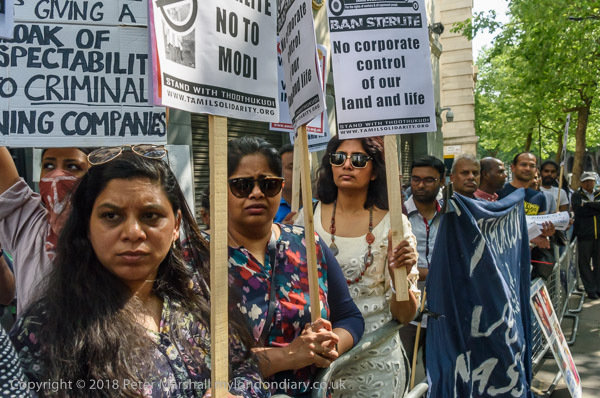 As a photographer I’m obviously attracted to the more visual of the protesters and the more interesting of the posters and placards. There are other individuals and groups that stood out for me, including these women from Mother World. One of the first photographic books I bought was ‘On The Mines’ by David Goldblatt and Nadine Gordimer, published in 1973 in Cape Town, and I think purchased from Creative Camera’s bookroom in Doughty St, which played an important role in my own development as a photographer. Unlike many books, I still have that first edition hardback, and can still find it and am sitting looking at one of Goldblatt’s best-known pictures on its back dust-jacket, “Boss Boy”, taken in 1966 and from the essay ‘The Witwatersrand: a time and tailings’ with Gordimer’s text and Goldblatt’s pictures and captions which is the first of three parts of the book – which continues with his ‘Shaftsinking‘ and ‘Mining Men‘. So far I’ve read five obituaries of Goldblatt, though doubtless many more will be published, and I may even look out a dust off a short piece I wrote about him perhaps 20 years ago, though probably not, as certainly others knew him far better and probably wrote more perceptively about his work. 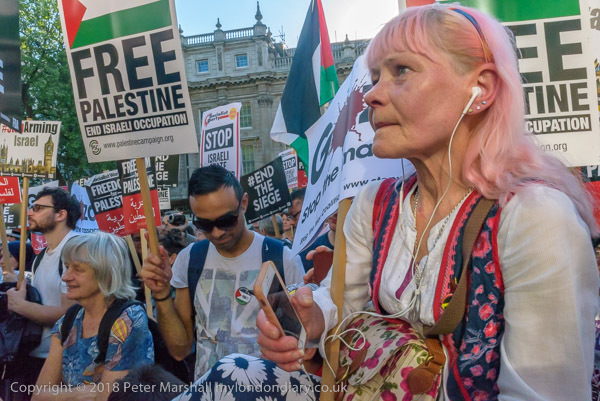 Of course, back when I was growing up we all knew about apartheid and condemned it – and as a teenager I remember acting a part in a play about it, and later joining the Anti-Apartheid Movement and going on marches and protests. But Goldblatt’s photographs, often very calm and carefully composed like that superbly framed ‘Boss Boy, the tips of the folding rule in his top pocket a fraction from the tope of the frame and his presentation ‘Zobo watch presented by the company for his safe working at the bottom edge, and on his left arm the company’s three star rank ‘Boss Boy’ metal badge touching the right edge of the picture, along with the texts strikingly brought home the realities of living under the Apartheid regime. The five articles I’ve so far read are in the New York Times, The Daily Maverick and Mail and Guardian from Zambia, Al Jazeera and The Guardian. 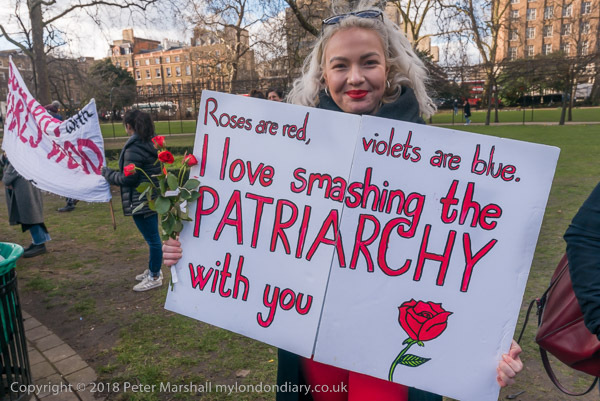 International Women’s Day was a busy time for protests in London, though I think none of them got in the news, where there seems to be a consensus that only middle class women’s issues matter on that day. International Women’s Day began in New York in 1909, when the Socialist Party of America organised a National Women’s Day there on Feb 28th, and the following year it was adopted as an international celebration by the 1910 International Socialist Woman’s Conference. 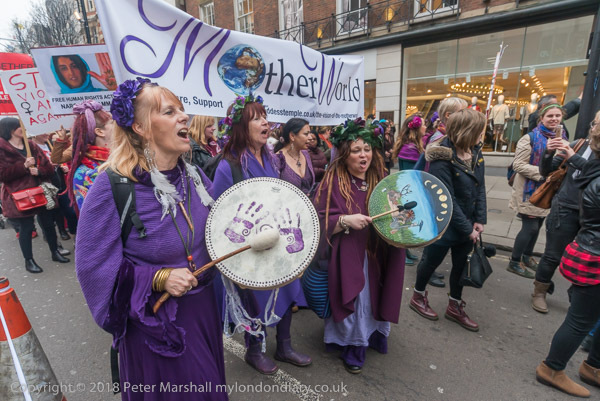 In 1914 the date became standardised as March 8th, and in London the Suffragettes marched, with Sylvia Pankhurst being arrested on her way to speak at the rally in Trafalgar Square. And on March 8th 1914 in Russia (for them it was still Feb 23rd) it was the actions by women in cities including Petrograd and St Petersbury that began the Russian Revolution against the Czar – and a week later he abdicated and women were given the vote by the provisional government. It was only the the 1970s, that the UN took up the day, and in 1977 it was adopted as the UN Day for women’s rights and world peace. Though we seem to have rather given up on world peace. 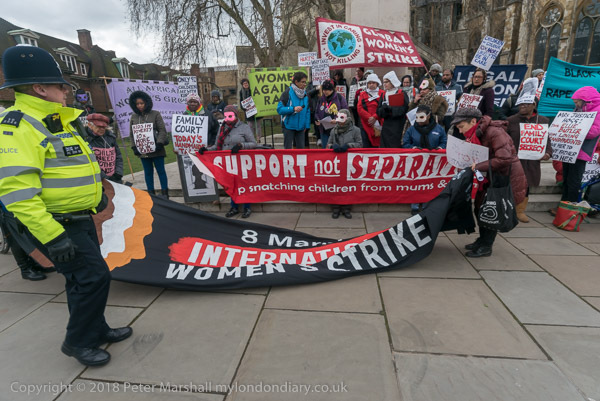 My Day began in Parliament Square, where Global Women’s Strike were staging a mock trial of the Family Courts. They say the courts fail families and remove children for adoption unnecessarily, mistaking poverty for neglect and failing to give support to victims of domestic abuse, and disabled mothers as required by the 1989 Children Act, and the Care Act 2014 . In Spain almost half of children needing taking into care are placed with kinship carers – mainly grandparents – while the figure for the UK is only 9%, less than one fifth as many. 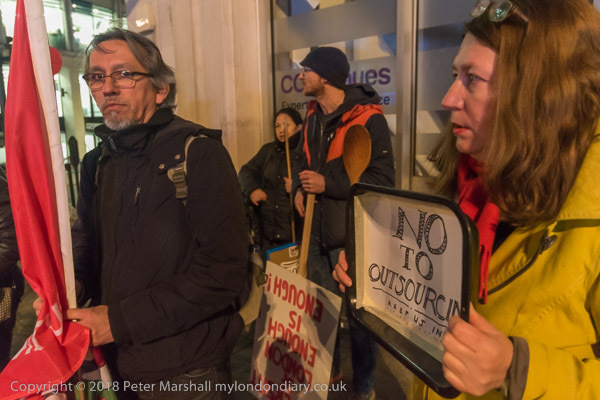 Next I went to Russell Square where women were taking part in the London Women’s Strike, refusing to do work either paid or unpaid, including housework and domestic work. 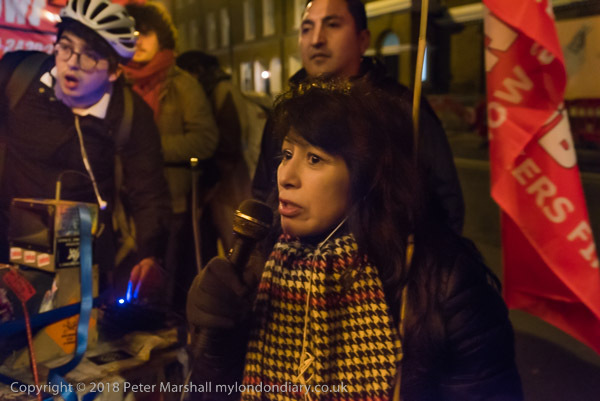 There were speeches and singing and various events both in Russell Square and elsewhere in London supporting protests concerning women, three of which I attended. 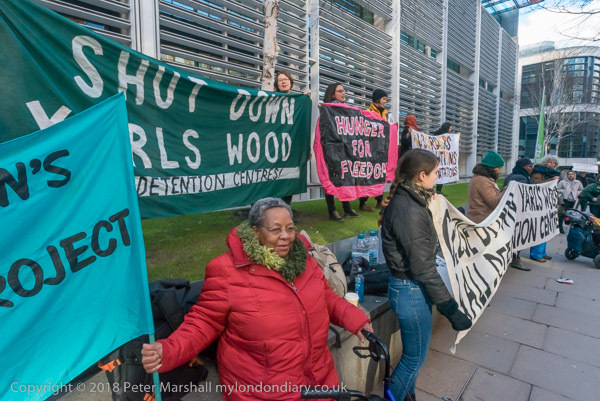 The first was at the Home Office, where protesters had come to show solidarity with the women detained in Yarl’s Wood, some of whom were on the 15th day of a hunger strike and general strike against their imprisonment and the conditions and treatment by the detention centre staff and the Home Office. 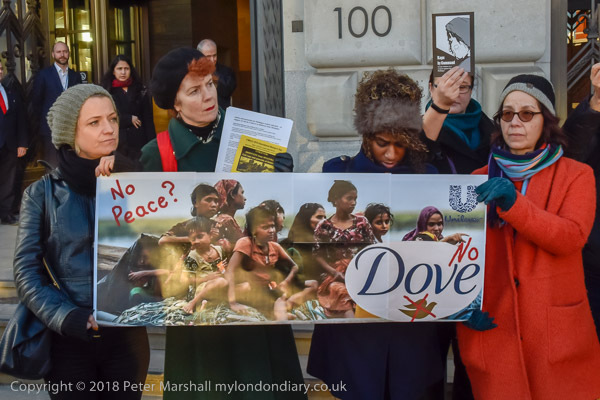 The Home Office has so far responded to their demand for proper treatment by issuing public denials that the action is taking place and sending letters to the women taking part threatening them with accelerated detention. Next I met the CAIWU at Covent Garden, where a largish crowd from the London Women’s Strike had come to support the cleaners, mainly women, at the Royal Opera House, where several CAIWU members are bing victimised by contractor Kier for taking part in successful union action to get a living wage there.The larger crowd made the protest more impressive, but it took a whole series of almost daily actions there for some weeks to get justice. Although some of the women were going on to further events for the day, by the end of this I was exhausted and decided it was time to go home. The widest full-frame rectilinear lens I’ve ever used is a 12mm, which gives a measly 113 degrees, and stretched out objects at its edges to an often ridiculous extent. Even the 16mm of the 16-35mm (currently in a broken state on my desk) with it’s 97 degrees had to be used with extreme care. I sometimes miss the extra width now with my 18-35mm, (90 degrees) but it is a lot easier to use. Looking at the edges of the image above, buildings and plants, including the slender tree trunk have retained their natural shape and size, even right into the corners of the image. Holding the camera absolutely level enables the horizon to be kept straight, but has the disadvantage that it is always exactly across the centre of the image, often where you want it, but with a whole series of images it can become rather monotonous. This is one reason I often crop from the 1.5:1 format in which I make these images to 1.9 or 2.0:1. A second reason concerns horizontal lines away from the image centre. Although the image is corrected to make vertical lines straight, other lines away from the horizon become increasingly curve. While this does not often show in a sky area, it can create unnatural-looking curves in the foreground. Cropping some of this can often remove the most glaring effects. The ‘moat’ creates an almost perfect subject for the treatment, being curved. The lens perspective enhances that curvature, appearing to wrap it more around the building than is truly the case. It could be seen as a problem, but it does improve the picture. Where things are less happy is with the building itself, which is basically a cube with some added decoration on three sides (only one of which is visible from this viewpoint.) To me this picture clearly makes the corner shown look less than the 90 degrees it actually is. 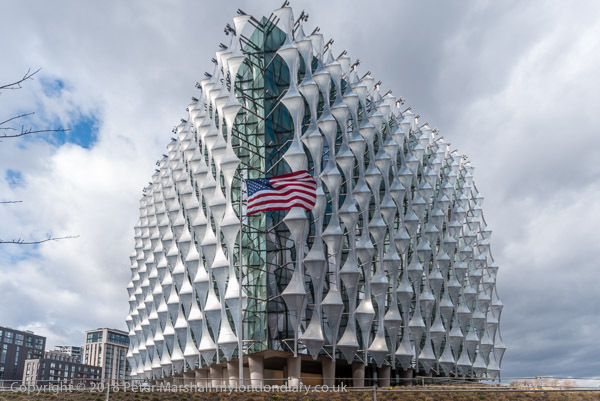 Even with a rectilinear lens, working close to the embassy doesn’t really show it as a cube – this picture is with the 18-35mm at 18mm. From the other side of the road it perhaps looks rather more the shape it really is – as the picture below shows. 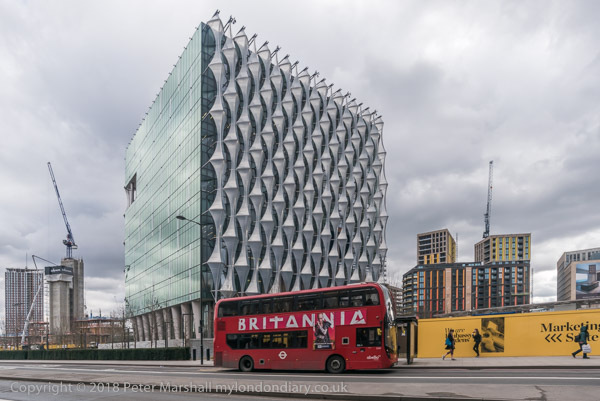 But for various reasons I feel it is a building better viewed from a distance – as I do most days when I’m travelling up to London. Though since the trains on this route no longer have windows that open it is hard to avoid reflections and the view is seen through often scratched and dirty glazing. More pictures around the embassy at Embassy Quarter. 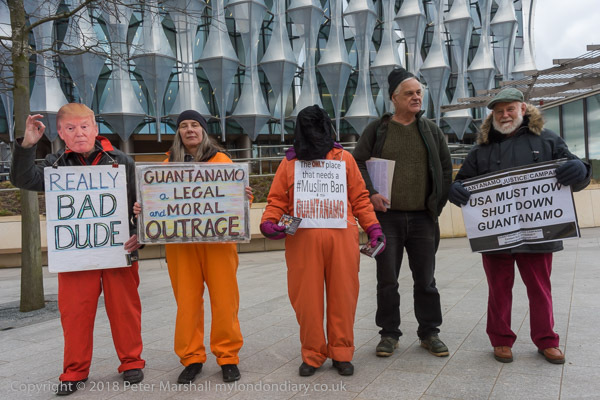 The protest I had gone there to photograph was the regular monthly Shut Guantánamo protest by the London Guantánamo Campaign, which have been taking place outside London’s US Embassy since 2007. This was there first protest at the new location, which some had problems with finding and only arrived after I had to leave. 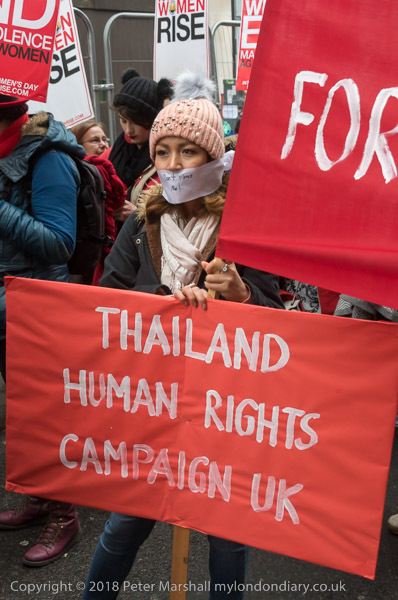 They intend to continue these monthly protests until all of the 41 still held there have been released and the illegal prison camp closed down. Opening shortly at the Barbican is ‘Dorothea Lange / Vanessa Winship – A photography double bill‘, with Dorothea Lange: Politics of Seeing showing together with Vanessa Winship: And Time Folds in the Art Gallery there from 22 June —2 September 2018, presenting the work of two photographers I greatly admire. 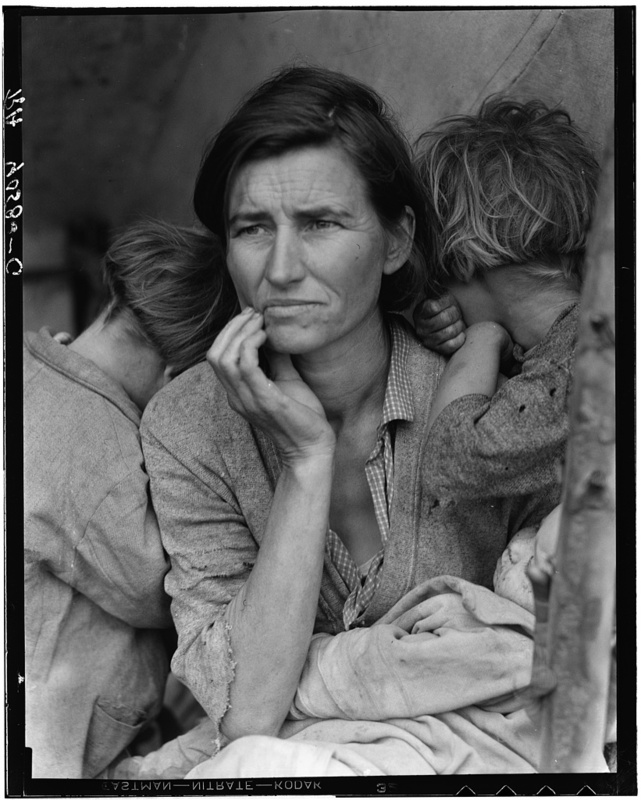 I’ve several times printed a copy of Lange’s best-known picture, ‘Migrant Mother‘ from the high-quality large Tiff file that I years ago downloaded from the Library of Congress, and have written on several occasions about this and other works such as her ‘White Angel Breadline‘ from 1933 which prompted her career as a documentary photographer. “a well-dressed woman jumped out of a smart newish car and started taking pictures, getting closer with each shot. Florence decide to ignore her. Lange gave a long interview to Richard Doud in 1964, a year before her death. You can hear 12 seconds of her voice and read the lengthy transcript in the Smithsonian Oral History Collection. 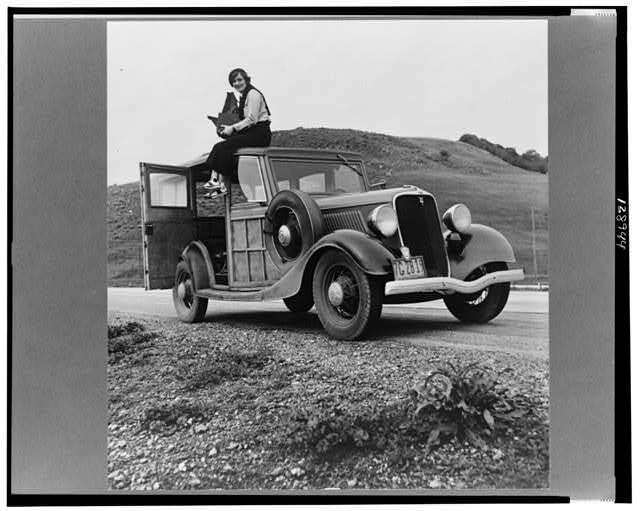 Dorothea Lange was born in New Jersey. She gave up training to be a teacher to become a photographer, working part-time in the portrait studio of Arnold Genthe before studying with Clarence White. She moved to California, meeting Imogen Cunningham and opening her own portrait studio. In the early 1930s she began to take pictures of people suffering from the effects of the Depression, such as the ‘White Angel Breadline‘ in San Francisco in 1933. The following year she met sociologist Paul Taylor who she was to marry (after divorcing her first husband, painter Maynard Dixon) and began to work for various Government projects, most notably the Farm Security Adminstration. Her career was interupted by illness for almost ten years from 1945, following this she travelled extensively around the world with her husband before settling down to photograph things ‘close at hand‘ around her home and family. One single picture she took for the FSA stands as an icon of the depression. ‘Migrant Mother‘ shows a mother looking worried into the distance, as if wondering what future there is for her. One child lies sleeping on her lap, two older children frame her, turned away from the photographer with their heads bowed. Lange recorded that the mother was aged 32 with 7 children; they were migrant pea-pickers but the harvest had been ruined by frost so there was no work. They had already sold the tyres from their car for food and were now living in it, keeping alive on wild birds the children caught. At the time I commented: “Though I’m afraid the explanation is unfortunately rather simple. 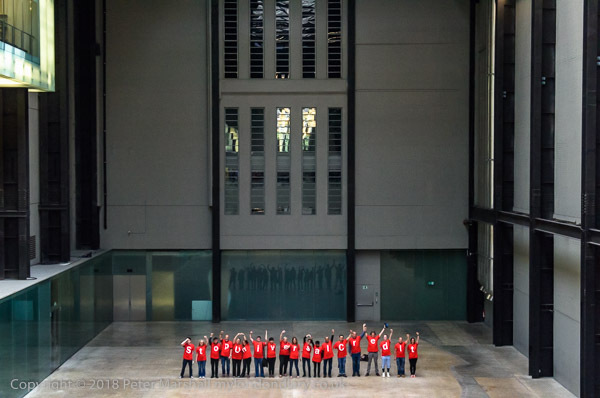 She is a real photographer, and there is no major British gallery with a real interest in photography.” It is great to see her work acknowledged at last in the Barbican show. May was another busy month, despite my intentions to take things easier and a rather painful right leg which did make me decide to miss a few events. Going away for one weekend and attempting to celebrate my birthday also had little effect on the amount of work. 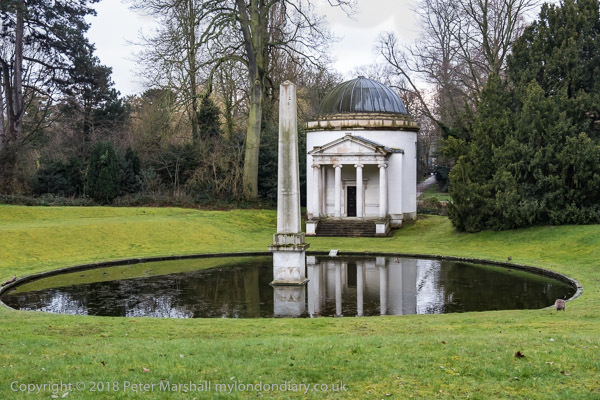 I did manage several walks with myself and family which are included here; though relaxing in some ways they often take more time in researching what I have photographed – the late May Bank Holiday stroll from Falconwood to North Woolwich being a good example. Outsourcing of staff is a dark practice used by many organisations to retain their own shining images while screwing their workers, who get the kind of management, employment rights and wages you would expect from least scrupulous of companies whose only concern is making profits while reducing their bids for the contracts to the lowest possible levels. So it was perhaps appropriate that this protest by the IWGB which represents cleaners, security officers, receptionists, porters, gardeners and others who work at the University of London keeping its central services running outside Vice Chancellor Sir Adrian Smith’s graduation dinner should be one of the darkest that I’ve ever tried to photograph. 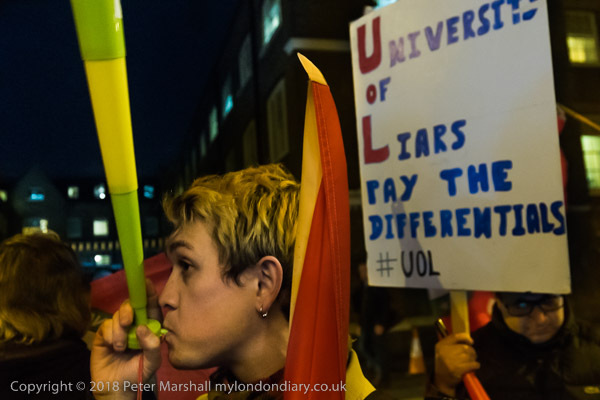 The protesters were in their usual good spirits, making a great deal of noise and calling for the university to employ them directly, for an end to zero hours contracts and to implement promised pay rises. In the days of film, the only possibility would have been to use flash (or pay a fortune to light this as a film set.) But digital has shifted the possibilities, and I decided to work with what little available light there was, and just occasionally to supplement this with my handheld LED light source. This event soon showed the limitations of this, a Neewer CN-216, at least when running from rechargeable AA batteries, when the power drops off considerably after only a few minutes of use, though it continues to give some light for several hours. Most pictures were made without its help. The light will also run from a number of Sony and Panasonic batteries and Neewer also make high-capacity ones to fit which might improve the performance. Almost all the pictures were made with the camera set at ISO 12,800 and with an exposure bias of -0.3 or -0.7 stops, and were still mainly underexposed, at shutter speeds mainly around 1/30 – 1/50s. Neither of the two lenses I was using was a fast lens, the 18.0-35.0 mm f/3.5-4.5 and the 28.0-200.0 mm f/3.5-5.6, and I often had to stop down a little for depth of field. 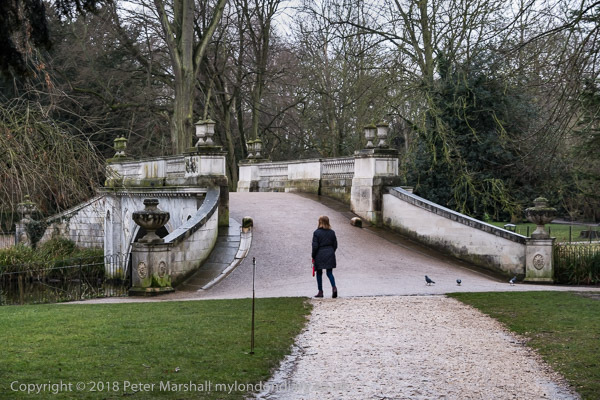 I don’t own any very fast lenses, but hadn’t expected these Stygian conditions or might have replaced the 28-200 in my bag with the heavier Sigma 24-70mm and added the petite Nikon 20mm f2.8 for luck. Neither is particularly fast but a stop or two does make a noticeable difference. But apart from being heavier, and running out at only 70mm when I often want something longer, somehow I just don’t trust the Sigma. It wasn’t a cheap lens, but I think isn’t quite sharp enough wide open to be worth carrying the extra weight. I bought it for use on DX where it perhaps does better. 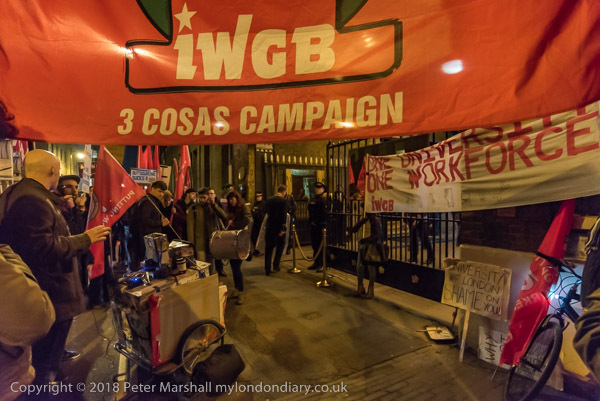 The IWGB met outside Barbican station and marched to protest outside the dinner through the tunnel under the Barbican. There the lighting was much brighter and I was able to work at a lower ISO even using shutter speeds around 1/100s. You are currently browsing the Re-photo blog archives for June, 2018.